According to a March 21 memorandum, federal funding for the U.S. Environmental Protection Agency (EPA) will decrease by 31% if Congress approves the President’s Budget for 2018 fiscal year. The decrease would cut funding for several voluntary and region-specific EPA programs to refocus the agency toward its “core statutory responsibilities,” the memo states. David Bloom, EPA’s acting chief financial officer, penned the memo. Among 43 total EPA programs that the White House intends to eliminate are grants classified under Section 319 of the Clean Water Act, which enable states to address nonpoint source pollution associated with agricultural and stormwater runoff. The memo says federal programs to target runoff pollution instead will be coordinated from the U.S. Department of Agriculture (USDA) if the President’s Budget is approved. “The agency should continue to coordinate with the USDA on targeting funding where appropriate to address nonpoint sources,” the memo reads. Last year, Congress allocated $164.5 million for Section 319 grants. 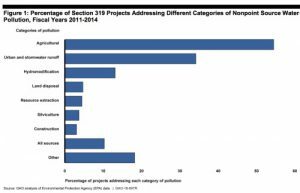 Between fiscal years 2011 and 2014, Section 319 grants funded at least 3080 water quality projects focused on combatting nonpoint pollution sources, according to a July 2016 Government Accountability Office report. Many of those projects supported coordination between states to identify nonpoint source pollution causes and remedies within mutual watersheds, efforts to implement less invasive farming practices, and research, education, and technological innovation campaigns. EPA and USDA routinely work in tandem to assist states with nonpoint source pollution issues. The budget memo reasons that defunding Section 319 grants will limit federal spending on duplicative activities. But some are concerned that stripping EPA of its grant-giving role will make an already uphill battle against pollution harder to win. programs to counteract marine pollution. “Within the Office of Water’s Clean Water Act-related programs, priority is to be given to functions required by statute and mirrors the overall goal of decreased federal involvement in local programs,” the memo reads. While the agency faces sharp cuts across the board, the president’s proposed budget shows support for programs related to infrastructure. For example, the memo recommends $18.2 million in funding for the recently implemented Water Infrastructure Finance and Innovation Act to be awarded to public and private water infrastructure projects that meet the program’s criteria. The possibility of a sweeping infrastructure bill, which President Trump touted on the campaign trail, remains on the table. “The National Economic Council and Office of Management and Budget will reach out to EPA in the coming weeks/months to discuss next steps on the initiative to rebuild and modernize America’s infrastructure,” the memo concludes.